Summary: Porsche sat 1-2 at the top, with the #47 KCMG Oreca, #51 AF Corse 488 and Clearwater 458 topping their respective classes in the first session of Le Mans week which saw multiple rain showers throughout. 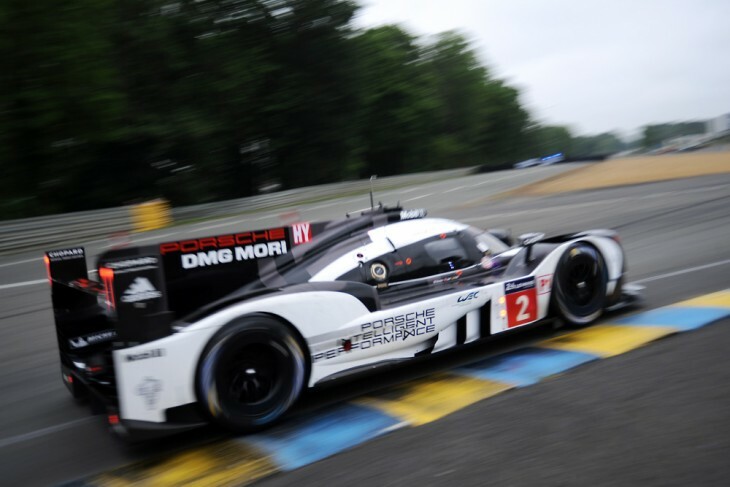 The #2 Porsche 919 Hybrid set the pace in Free Practice ahead of the 84th running of the Le Mans 24 Hours, with Neel Jani setting a 3:22.011 in the final minutes of the four-hour session. Brendon Hartley’s best topped the screens for much of the final hour, but in the end the car finished up second, making it a 1-2 for the German marque. The Kiwis time was a 3.22.550, half a second back. 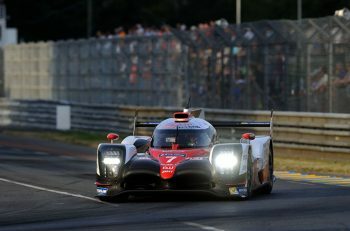 The fastest cars from the three manufacturers in LMP1 though, ended up just over a second of each other during the running, with Toyota, Audi also topping the times at points. 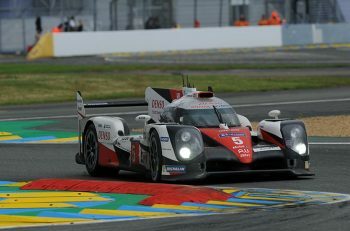 Early on it was Toyota which set the pace, with Anthony Davidson in the #5 TS050 setting an early 3:25.437, but when the rain came 45 minutes into the session the #8 Audi R18 was at the top of the screens. Loic Duval had set a 3:24.852. The rain came down hard at parts of the circuit, and with times beginning to tumble the ByKolles CLM caught fire on the exit of the Forza chicane down the Mulsanne straight; Pierre Kaffer having to jump out and help the marshals fight the fire. The session was red flagged. When the action resumed and the track began to dry out, the Porsches came to the fore, with Brendon Hartley setting two fastest laps in relatively quick succession, his best being a 3:22.550 before the second red flag of the session was called after the Morand Ligier hit the tyres at Indianapolis. In the end, behind the two Porsches and rounding out the top three was the #8 Audi which reeled off a 3:22.985. The first of the Toyotas (the #6) wasn’t far back, just over a second off in fourth. The #8 however had its running cut short, after Lucas Di Grassi had to pit after a slow lap with an apparent technical fault in the final hour. 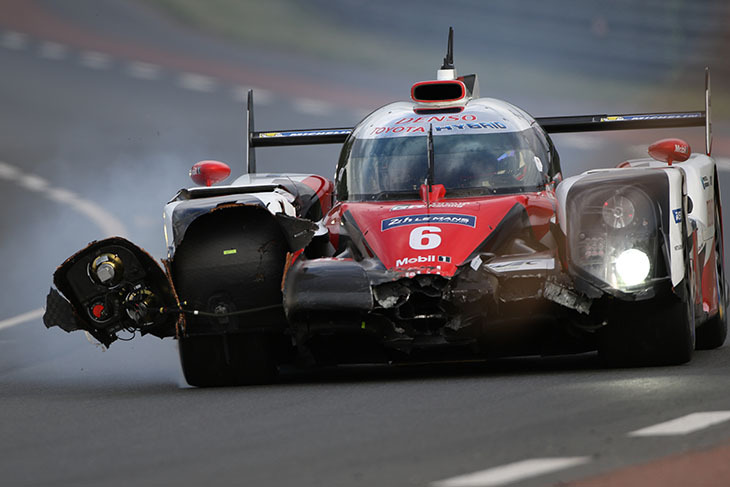 The #6 Toyota with Stephane Sarrazin driving also had its troubles, with the Frenchman having an off on the run down to Mulsanne Corner, damaging the front end as the third and final red flag came out. It limped back to the pits however. With the Kolles crew having limited running, the two Rebellions finished 1-2 in the privateer subdivision. The #12 ran quicker than the sister car and was six seconds back from the quickest hybrid. 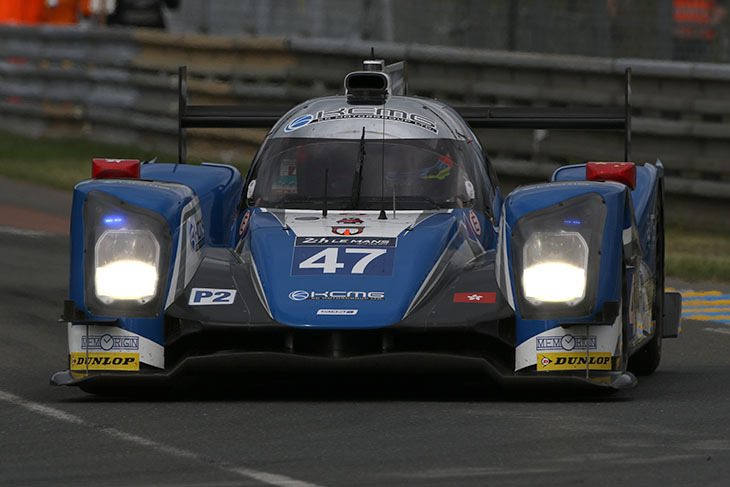 In LMP2, last year’s champs, KCMG, started where they left off from 2015, topping the times. In the dying minutes Richard Bradley set a 3:39.133, ahead of Nicolas Lapierre in the #36 Alpine which set its time just before the second red flag of the session, putting up a 3:39.721. in a session which saw many members of the class have offs. Third was was the #23 Panis Bathez Ligier after Paul Loup Chatin’s 3:40.308 moments after Lappiere’s hot lap. The #33 Eurasia Motorsport Oreca 05 which topped the times for the majority of the session thanks to a flyer from Tristan Gommendy before the rain came home fourth with Thiriet By TDS’ Oreca rounding out the top five. David Cheng in the Baxi DC Alpine had a pair of offs at the Dunlop Bridge, as did Marc Goosens in the Murphy open-topped Oreca, but neither was damaged. Bruno Senna and Ines Tattinger however, weren’t as lucky, as the front end of both the RGR Ligier and Pegasus Morgan sustained damage after contact with barriers in their incidents. While the aforementioned incident for Senna took place at Indianapolis, Tattinger’s off was at Karting and brought out red flags which ended the session seven minutes early. At the stroke of 4pm, all cars from the GTE ranks filed out to take advantage of what proved to be a fairly brief window of fine weather at the start of the session. 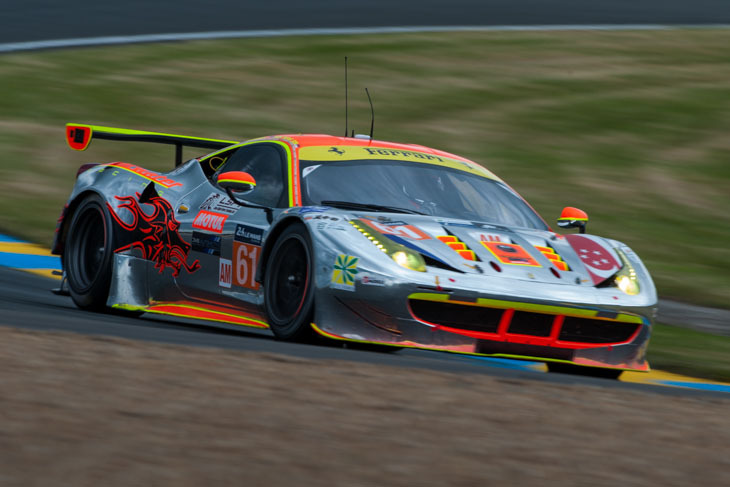 In GTE Pro, Alessandro Pier Guidi set the initial benchmark; 3:56.558 the time for the #51 AF Corse Ferrari. With the clouds starting to build after just a couple of laps, Patrick Pilet’s #91 Porsche tucked in behind on 3:57.789. Harry Tincknell went third, with Olivier Pla almost equalling the Ford time in fourth. 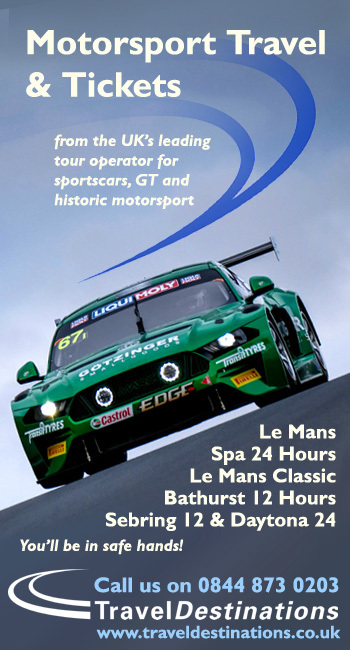 Pla posted a 3:56.294 on the next lap to go quickest as Ford’s Le Mans weekend started in earnest. Pier Guidi immediately threw one back at the Ford though, a 3:56.150 resuming the #51 car at the top of the GTE Pro timing screen. Pedro Lamy wasted no time in posting quickest GTE Am time in the #98 Aston Martin; his 4:02.013 three tenths ahead of the #60 Formula Racing Ferrari of Mikkel Mac Jensen, before the Dane ‘s time was bettered by the#62 Scuderia Corse Ferrari of Jeff Segal. Back in Pro, Harry Tincknell went quickest again for Ford with a 3:56.094 for the #67 car, tenths being shaved off rather than huge chunks at the front of the field. At 30 minutes into the session, Pla took the top spot away again with a 3:55.081. 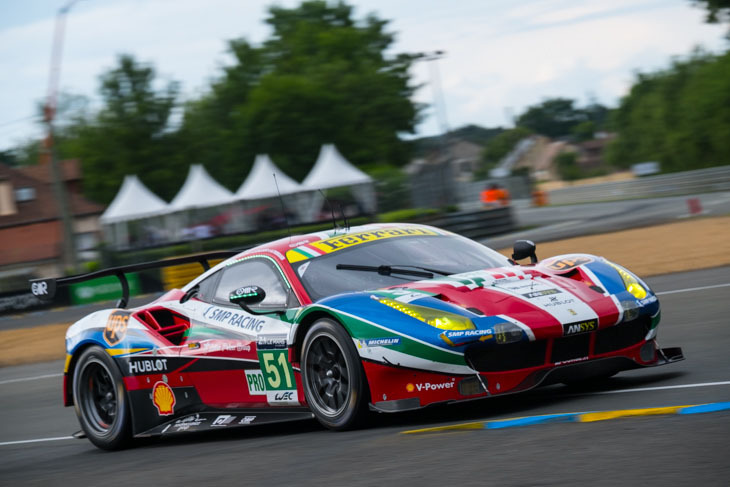 Giancarlo Fisichella’s first lap in anger netted fifth in Pro for the Risi Competizione 488, this soon improving to elevate his car to second. The fastest GTE Pro times now stood in the 3:55s, the benchmark set on test weekend by Jan Magnussen’s Corvette. Matt Griffin aboard the green AF Corse Ferrari then took second in Am as things started to loosen up in the class, just a couple of tenths off Lamy, whose time for the leading Aston Martin had improved to 4:00.982. This situation didn’t last long, though as Pat Long’s #88 Abu Dhabi Proton Porsche posted the first sub-four-minute lap in GTE Am: 3:59.592 was now the target to beat. The order was shaken up again as the AF Corse car was deposed to third by Pierre Ragues’ Larbre Competition Corvette. Ford then made it 1-2-3 in GTE Pro as Joey Hand lapped 3:55.928 with 40 minutes of the session on the clock. This was turning into a Ford vs. Ferrari stand-off, the Italian cars fourth, fifth and sixth as Toni Vilander improved the #82 Risi 488 for second and Andrea Bertolini raised the #71 AF Corse car into sixth. This was just as a wet track was called, light rain appearing at Mulsanne corner and then shrouding the whole circuit. When conditions becoming properly wet, track activity unsurprisingly became rather more considered. Tyre choice became tricky as intermediates and wets were cycled in the hunt for wet and damp set-ups and drivers took turns dialling themselves in, before a red flag for the ByKolles LMP1 fire saw the session halted almost exactly halfway through its four-hour duration. Light rain continued to fall once the track went back to green and shortly after this, the #55 AF Corse Ferrari came back to the pits with a right-rear puncture. Another unplanned pit visitor was the #64 Corvette, which was suffering issues with its GPS and telemetry systems. 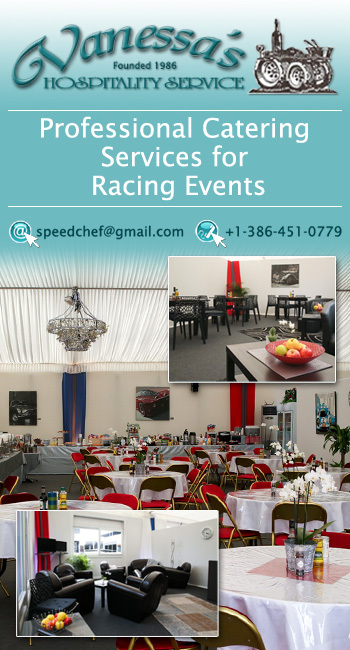 With an hour and a half to go, steady rain from the Porsche Curves to the front straight impeded any possible time improvements, but the laps continued to be racked up as teams got wet-weather running under their belts. There was a brief moment of drama for the #60 Formula Racing Ferrari when Johnny Laursen had to avoid the spinning Murphy LMP2 car, but the Dane escaped without contact. Improving with an hour and 20 minutes to go was the #77 Proton Porsche, with race debutant Phillip Eng at the wheel, leaving the two works Corvettes propping up the bottom of the Pro class on the timing screens. With the sun now out on the main straight, conditions appeared to be improving once again, evidenced by Gianmaria Bruni going third-quickest in Pro in the #51 Ferrari with a 3:55.816. An intra-team battle then broke out as Bruni was demoted to fourth by Rigon in the #71 488. The order was also changing in GTE Am, where Rui Aguas unseated the Larbre Corvette from third place by going around in 4:01.108 in the #83 Ferrari. With just over an hour of the session remaining, Toni Vilander in the Risi Ferrari managed a 3:54.522, the fastest time until that point and four-tenths up on 2015’s pole lap. Second in Am was then snatched by Townsend Bell in the Scuderia Corsa Ferrari, however the Proton Porsche remained the only car in the Am category to have dipped below the four-minute mark by this point. Corvette began to hint at its potential pace in the final hour, Antonio Garcia getting the #63 into seventh, while a series of quick laps shuffled the pack in GTE Am: Townsend Bell now sat fastest in the Scuderia Corsa Ferrari, demoting the #88 Porsche to second, while its sister #78 car went third courtesy of Wolf Henzler, pushing the Clearwater Ferrari of Rob Bell down to fourth. The times continued to tumble in Pro, Ferrari’s Bruni clocking a 3:53.8 to go first and Ford’s Bourdais putting the #68 GT third with a time roughly a second slower. Matteo Malucelli meanwhile improved the #82 Ferrari’s time to a 3:54.1, but it remained second-fastest. Another red flag, again for an LMP2 off, brought proceedings temporarily to a halt. After the session resumed, there was a spin and light barrier contact for Billy Johnson in the #66 Ford at Indianapolis, but the American managed to rejoin the track and recover to the pits. 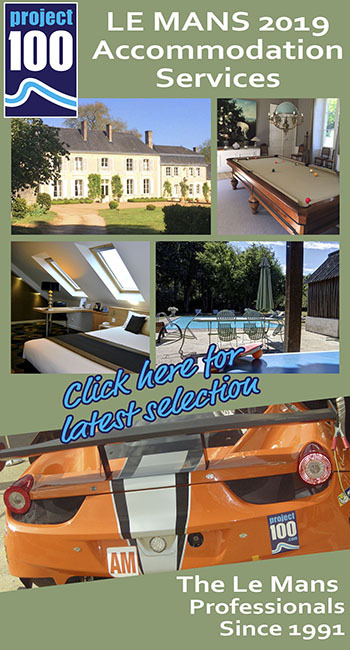 The session drew to a close seven minutes early when a third and final red was thrown when the Pegasus LMP2 car went off at karting. The final GT order saw the works AF Corse and privateer Risi Competizione Ferraris first and second in Pro, with the #68 Ford third. Fastest non-Ford or Ferrari runner was the #92 works Porsche 911, while Rob Bell in the Clearwater Ferrari managed to unseat the Scuderia Corsa 458 from the top of the Am class just before the final red.